It is a prestigious festival in the province of Romblon that gives honor to the Señor Santo Niño (image of the Holy Child Jesus) every January. 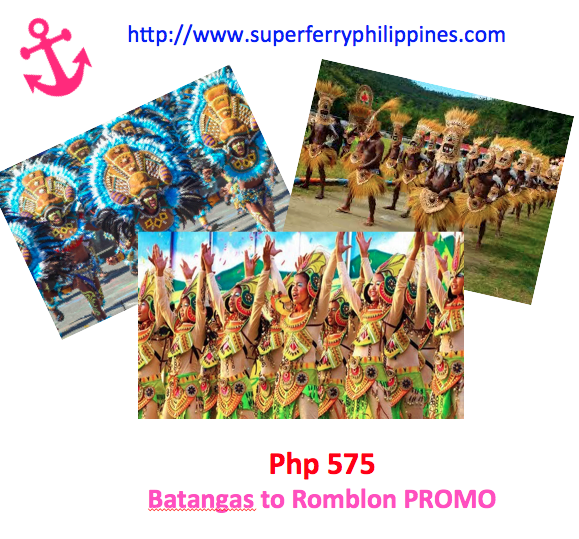 It is pretty much similar to Sinulog Festival in Cebu. Participants during their group presentation often wear bright and colorful costumes that attract both local and foreign tourists. It is definitely like a carnival with all those music, beat, and dancing moves. According to the story, the said festival commemorates way back to a time when a storm hit Romblon and the Spanish galleon that carries the replica of the Santo Niño left the place but instantly sailed back to shore. They then celebrated with a mass at a church. After the holy ceremony, the Spanish people tried to carry back the Santo Niño to the galleon but they couldn't move it. The replica stayed at St. Joseph Cathedral for centuries. But with one unfateful day, the replica got stolen in 1991 and was never recovered. One of the highlight of the event is the flotilla of vessels that encircles the Romblon bay reenacting the attempts of the Spanish Galleon to move the Sto. Niño out of Romblon. Expect a parade of colorful tribes while dancing and moving to the rhythm of the drum beats while showcasing their veneration to image of the Holy Child Jesus. Romblon has been the no. 1 producer of marbles in the country with quality comparable to that of Italy's. Get your tickets now! Call (632) 528-7000 or book online. 2Go Promo exclusive of VAT, Insurance and Linen Fee. Tickets are Non-Refundable but rebookable subject to applicable fees and fare difference. Good pm po ma'am mag pa book sana ako ng ticket manila to cagayan October 29 po ang alis nmin 5 po kming passenger magkano po ba.